There are three (3) types of “salvaged” vehicles in Nevada: 1) Total Loss, 2) Flood Damaged, and 3) Non-repairable . Nevada Revised Statutes and the Department of Motor Vehicles set out specific criteria for defining a salvaged vehicle and what to do with it after the fact. 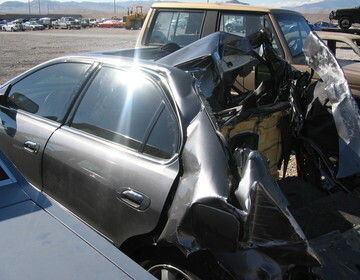 What happens with your vehicle after an accident depends on what type of salvaged vehicle it is. What does it mean for your vehicle to be declared a “Total Loss”? According to Nevada Revised Statute 487.790, a total loss is a vehicle that has been wrecked, destroyed or otherwise damaged to the point where cost of repair would exceed 65 % or more of the fair market value of the vehicle immediately before it was wrecked. If the cost of repair for the vehicle is less than 65% of its fair market value before the collision, then it is NOT a total loss. It is important to note, however, that costs associated with (1) painting any portion of the vehicle; (2) replacing electronic components in accordance with the specifications of the manufacturer; or (3) towing the vehicle are not considered in determining the cost of repairs. What is not included in the NRS definition of a Total Loss? Older Cars. The age of your vehicle is also important in making a determination as to whether or not it would be deemed a total loss. In Nevada, a vehicle that is 10 or more years old is not deemed a total loss if to restore the vehicle to its condition before it was wrecked, requires the replacement of only certain parts, like the hood; trunk lid; or a fender . To determine the age of the vehicle, the model year of manufacture is calculated based on a year beginning on January 1 of the calendar year in which the damage occurs. Cost of Repair is less than 65%. It doesn’t matter what the age of the car is---if the cost to repair the vehicle is less than 65% of the fair market value of the vehicle immediately before the vehicle was wrecked, destroyed or otherwise damaged, it is NOT a total loss. However, the cost of repair does not include the cost of (1) painting any portion of the vehicle; (2) replacing electronic components in accordance with the specifications of the manufacturer; or (3) towing the vehicle. Stolen Vehicles. A motor vehicle that was stolen and subsequently recovered, is NOT a total loss if the vehicle has no structural damage; and is only missing tires, wheels, audio or video equipment, or some combination thereof. What Happens After your Car is deemed a total loss? This can depend. If you were involved in an accident where the other driver was at fault, you will be dealing with their insurance company, (called the Third-Party or 3p insurer). They will want to get an estimate for what the total value of your vehicle was before the accident. An adjuster will contact you to inform you of the process for doing so. They may want to tow your vehicle to a repair shop for an estimate, or they will send an adjuster to you. If your car is drivable, they may ask you to drive it to a repair-shop yourself. You ARE NOT required to use their repair shop—you can have your own assessment done on the vehicle. How much will you get from the Insurance companies after your car is deemed a total loss? This will also depend. The at-fault drivers insurance company should pay the fair market value, or actual cash value (ACV), of your totaled vehicle—essentially the value of your car minus depreciation . If you aren’t sure what your car might be valued at, you can get a rough estimate from Kelley Blue Book . This may provide you with an idea of what the present ACV of your car would be. It is important to note, however, that insurance companies have their own system to determine the ACV of your vehicle. They may not use Kelley Blue Book so the number they offer may be different from the number reflected by your own research. Your Insurance Company Made an Offer for the “Total-Loss” of your Vehicle—What Happens Next? The Nevada rules governing insurance companies are codified in the Nevada Administrative Code, or (NAC). Specifically, you can find the rules applicable to automobile polices under NAC 686A.680  . Here, Nevada law specifically provides for the methods by which an insurance company can settle your total loss claim. Remember, settlements will vary by company. Your settlement will depend largely on the options provided by your insurance company and there are a number of factors that could affect the amount you are offered by the insurer . Ultimately, it is your decision and you should be comfortable with the choice you make. If you are not happy with the amount that your insurance company has offered, you may have options. You should talk to a licensed attorney about what those options might be. What do you do if you no longer have a vehicle to drive—Insurance provided Rentals? This is a common question, as most people require a vehicle to get them from work, to school or wherever it may be—having a car is important. Unfortunately, not all insurance companies will cover the cost to obtain a rental for the time being. It is important to know what your policy says in this regard. You should talk to your insurance company and see if your policy offers rental coverage. Make sure you ask how many days of rental car coverage are provided under the policy as well. A Total Loss of a car is when the cost to repair damages would exceed 65% of fair market value. You DO NOT have to go to the insurer's repair shop, and can have a 3-party evaluation done of the car.